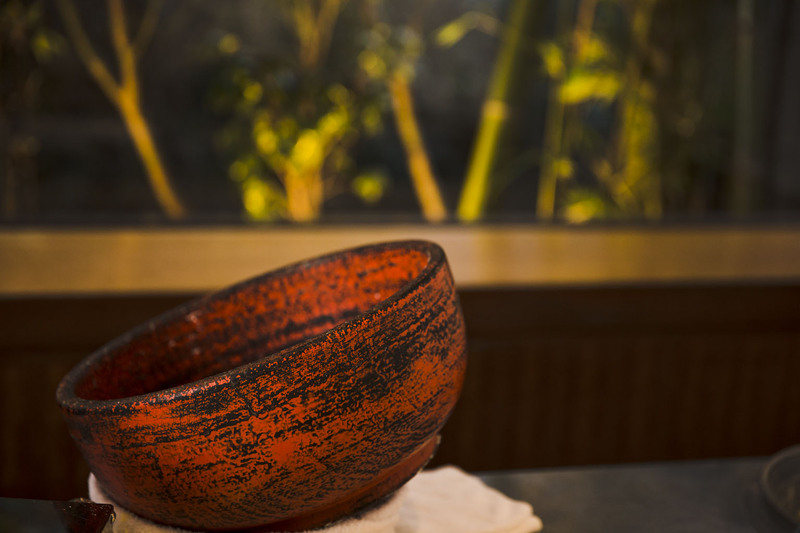 Dine on the season’s best in a warm, welcoming ambience that typifies omotenashi, Japanese hospitality. 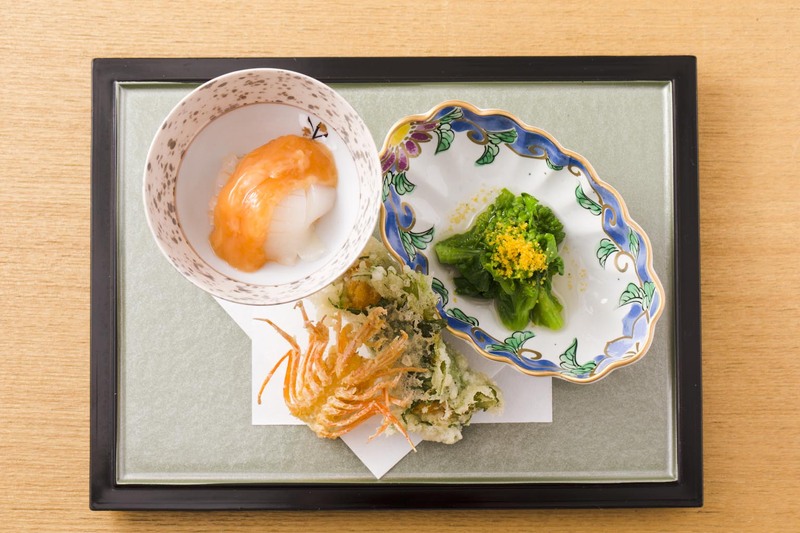 From the garden outside to the sumptuous meal inside, the Uchitsu experience offers a strong sense of the passing seasons through a complete Japanese course focused on tempura. The chef’s passion for quality compels him to visit producers directly, motivating them to achieve ever better ingredients to showcase to his fortunate guests. Step in to Uchitsu and escape from the busy world for a while. As soon as the wooden sliding door of the entrance is closed, the bustle of the street outside is behind you and your eyes are drawn to an enormous glass window and the beautiful garden beyond. Bamboo, pine, a cherry blossom – the mixture of plants brings splashes of color with each changing season. From where you sit, the garden seemingly drops away to nowhere, and the soft lighting that emerges as the sun goes down gives the space a decidedly romantic feel. From inside, you would never know you are in central Tokyo, but this is the lively area of Hiroo in Minato Ward, home to many embassies, international schools and fabulous eateries. The long counter seats no more than eight, allowing you to have an intimate meal but also to engage in conversation with the chef as he cooks. 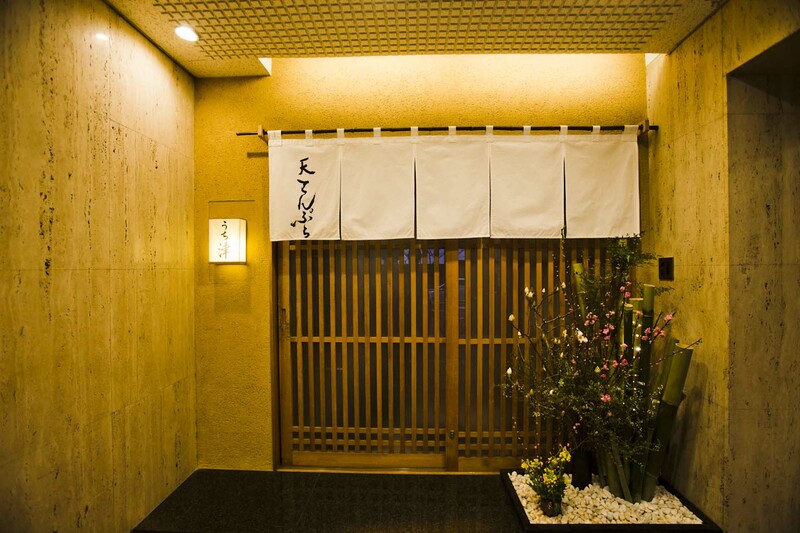 Cream-colored chairs, the clean wooden counter decorated with simple seasonal Japanese paper tablemats and alternating gold and silver chopstick rests, and Japanese paper sliding doors all around – it is at once elegant and comfortable with that distinctly Japanese sense of hospitality. On the first colorful plate of seasonal specialties you will find the incredible tempura combination of uni wrapped in a shiso leaf. The uni is cooked to perfection, almost rare, and its sweet velvety creaminess contrasts beautifully with the crisp tempura and fresh herb qualities of the shiso. 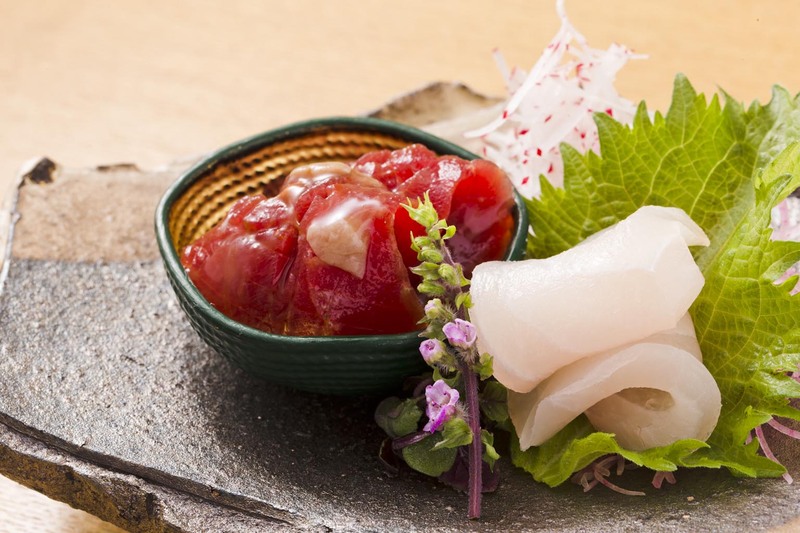 A sashimi course that follows may include aged yellowtail with a soft and creamy texture and a brandy-marinated tuna dish typical of Kanagawa Prefecture. Excitement builds as you hear the gentle sizzle in the pot and you know the tempura component of the meal is about to begin. 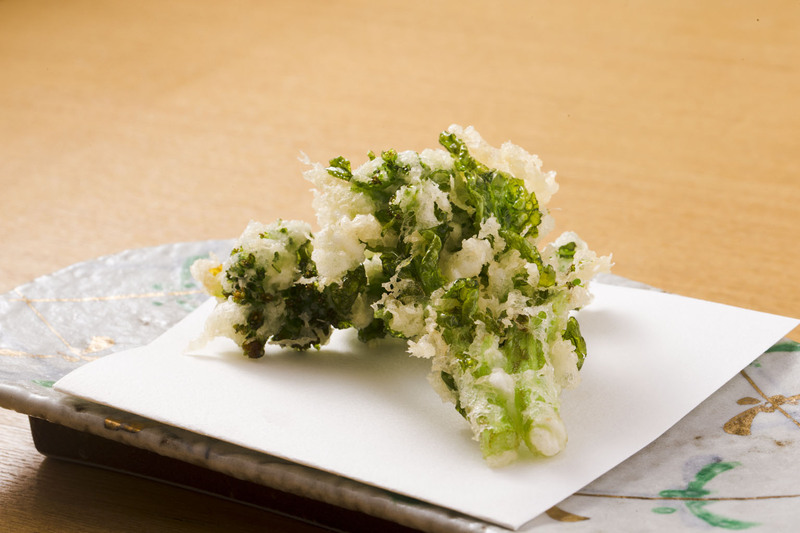 Well-known around the world, tempura must be cooked à la minute to really be appreciated. At Uchitsu, the batter is so light and airy you almost don’t notice it, but has that crispy texture that leaves you craving more. Each item is cooked just long enough to highlight the innate flavors of the tasty ingredients within. In spring, a selection of vegetables like fava beans, baby bamboo shoots, and spring greens are cooked right in front of you and placed on your plate piping hot ready to eat straight away. They are full of flavor and have that touch of bitterness the Japanese say is crucial to wake your body up from winter and restore vitality for the warmer months ahead. Interspersed among the seasonal vegetables is delectable seafood: the shrimp is plump and juicy; the scallops are rare in the middle and so very sweet. 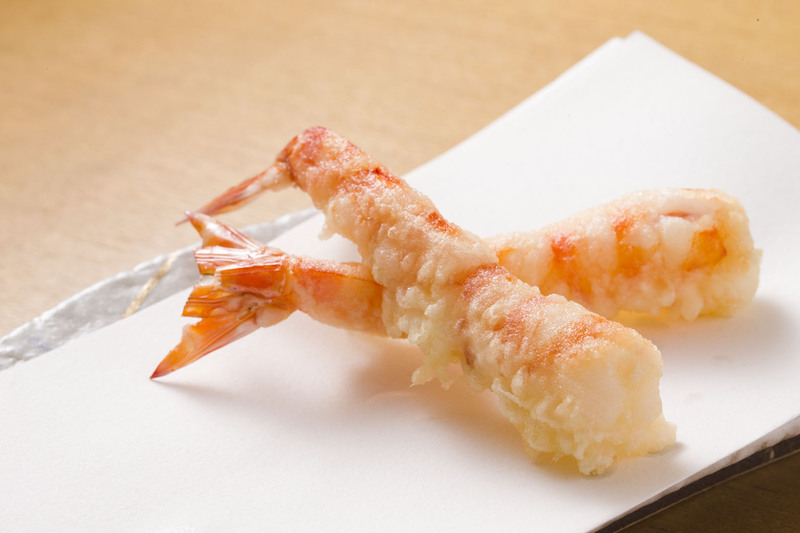 Some tempura morsels are dressed in a sauce, some are served with a squeeze of seasonal citrus juice, and others can be dipped in your choice of salts – a Kyushu sea salt or a homemade mineral salt. The chef has spent years experimenting to create his own recipe for a salt that contains dried shiitake stock and dark brown sugar, loading it with umami and additional minerals not found in other salt varieties. Both salts are delicious, but you may find yourself coming back to the homemade one over and again for that distinctive umami. The chef makes sure to include palate cleansers as a rest from the tempura, and the meal takes different turns depending on the season. In warmer months, there may be an additional sashimi dish, but in winter you may find an individual hot pot for lightly blanching fugu puffer fish and fresh wakame seaweed shabu-shabu style. 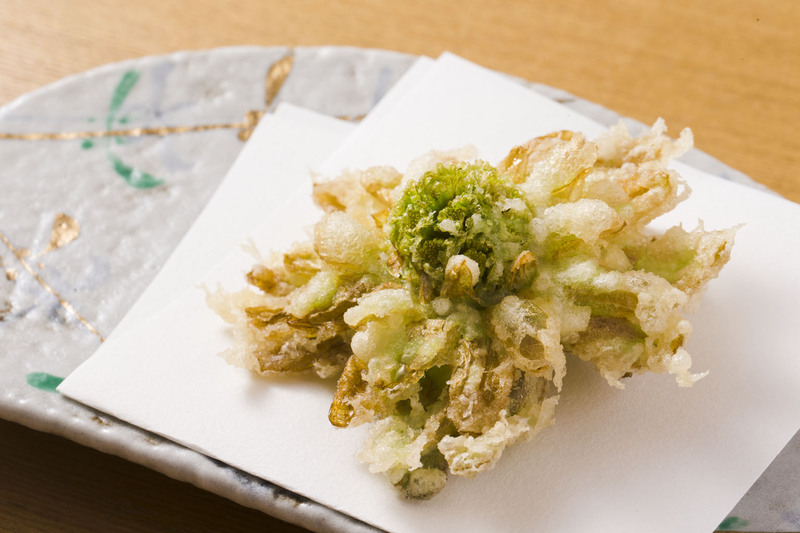 Whatever the season, the chef finishes the meal with a tempura fritter. While these fritters are most often seen topping a generous bowl of rice, Chef Uchitsu prefers to serve it with thin noodles called nyumen. 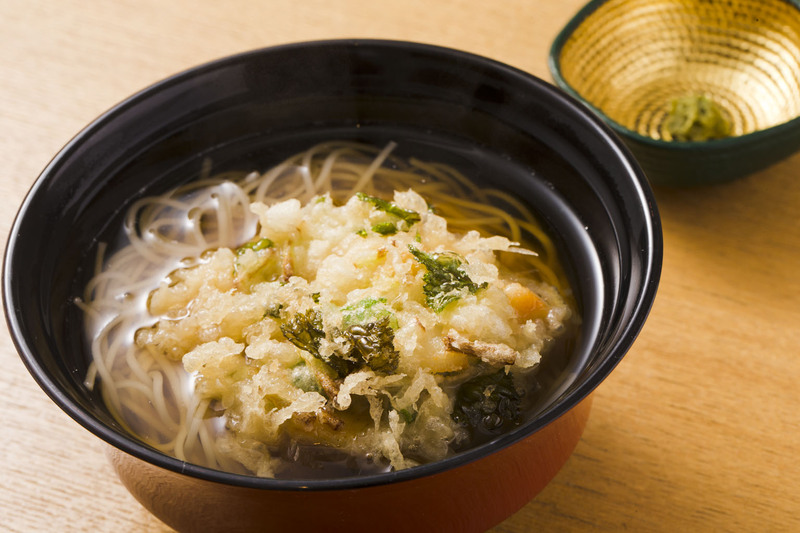 He loves the filling mouthfuls of noodles with the gentle flavors of the dashi soup, and thinks that a tiny dab of yuzu-kosho (yuzu zest and green chili pepper paste) brings it all together into the perfect ending dish. Drinks can be ordered from a selection of beer, nihonshu, and shochu, as well as still and sparkling wines. Or you can ask the chef to choose for you. If you enjoy nihonshu, you might like to try a variety made by the chef himself who travels to Otaru, Hokkaido to prepare the brew – a Junmai Daiginjo raw sake that he serves cold. It’s refreshingly sweet, with umami and a lovely aroma, but be warned, the alcohol content is 18%! Chef Uchitsu speaks directly with suppliers at Tsukiji every day, ordering seafood, vegetables and mushrooms from all over Japan, ensuring the pick of the harvest each season. Sending his apprentice to collect the goods at the market is just one of the ways Uchitsu is introducing his staff to the world of tempura, getting them accustomed to suppliers, and exposing them to the wealth of fresh ingredients at your fingertips when you are a chef in Tokyo. Concerned about food waste, Uchitsu is willing to pay more to get only the amounts he needs each day. He is also passionate about revitalizing small port towns and raising the profile of small-scale farmers and fishermen. 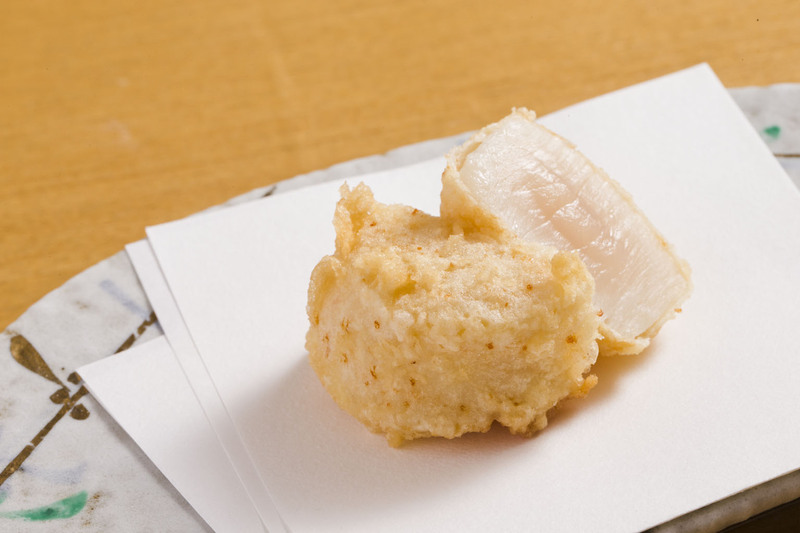 As one way of convincing them of the high quality of their produce, Uchitsu recently participated in a collaborative event in Chiba showcasing the delicately-flavored Japanese whiting (kisu) that features regularly in tempura menus. Takahisa Uchitsu was born and raised in Saitama, north of Tokyo. He was not a fan of his mother’s cooking, which motivated him to get into the kitchen from a young age. When his university ambitions didn’t go as planned, he took the opportunity to enroll in Tsuji Culinary Institute in Osaka. He joined prestigious restaurants straight out of culinary school but felt uninspired by the lack of hands-on food experience. He went and worked at a car factory and sat for the civil service exam, before returning to cooking, this time in hotels. He finally found the drive and inspiration he had been looking for and worked hard to hone his skills in Japanese cuisine. Uchitsu loved standing at the counter serving up deliciously fresh tempura, and it is not hard to imagine that his friendly, open-minded manner made him a hit with customers from around the world. He spent more than 10 years at the Odaiba Hilton alone, but felt his creativity and versatility were restrained by hotel guidelines regarding ingredients, so Uchitsu decided to go out on his own. At the age of 38 he went in search of a quiet, tranquil space, somewhat distant from any train stations. 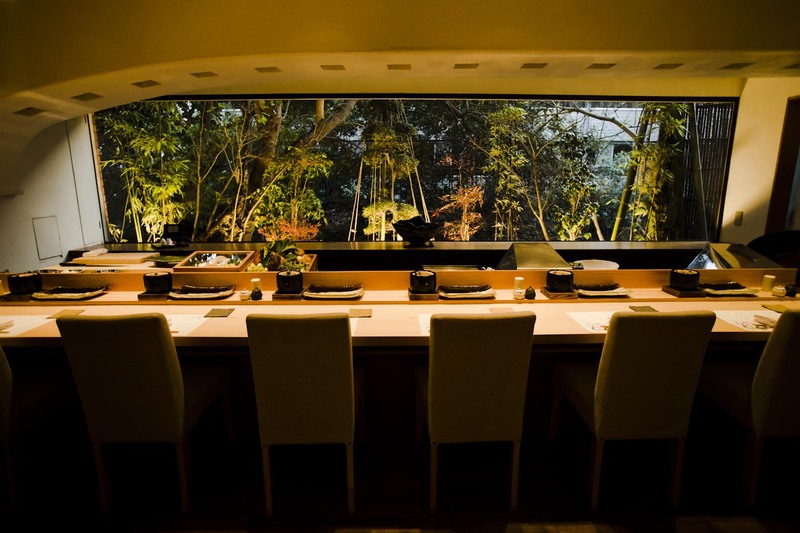 Instantly captivated by the magnificent window and the clean feel of the counter and traditional Japanese stucco walls, Uchitsu began his very successful career as a solo tempura chef. In the shorter term, Uchitsu’s vision involves raising his apprentice into a fully-fledged tempura chef who can stand at the counter confidently serving guests, not only meeting their needs but also engaging and entertaining. 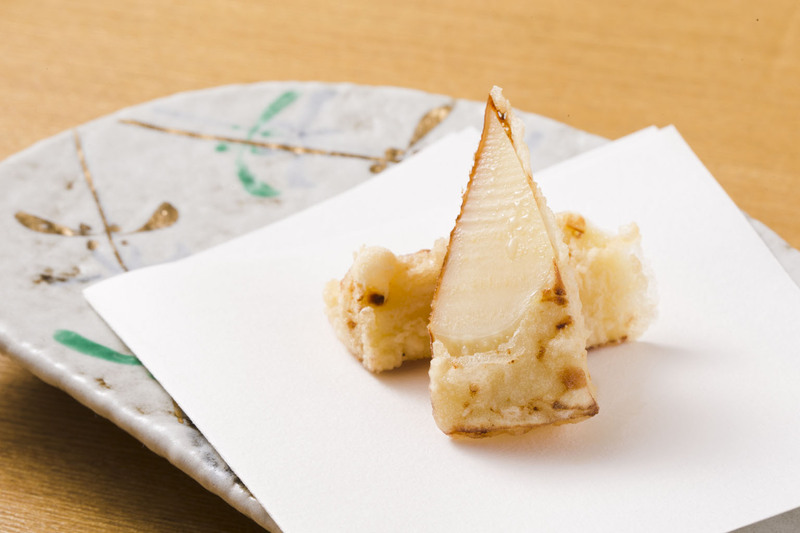 Focusing on giving customers the best in every bite, Uchitsu does not currently use the private room, but a talented and trained tempura chef by his side would make opening it up a possibility. 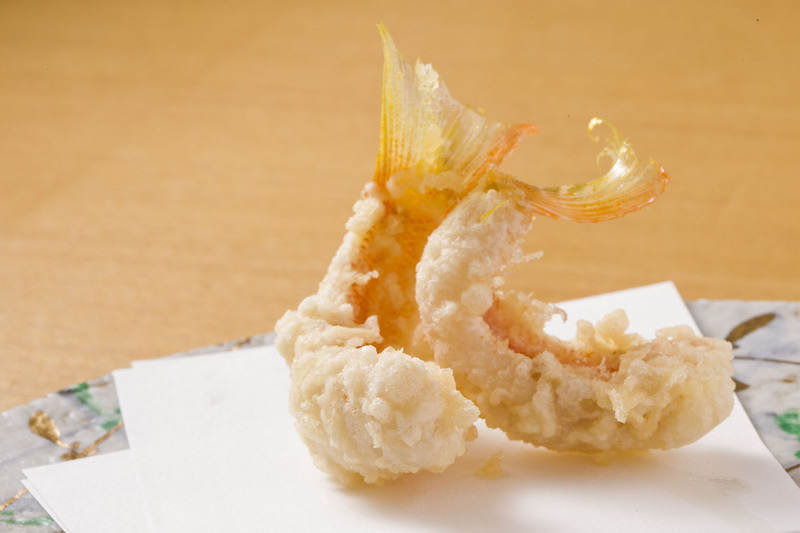 In the longer term, there would be more young tempura chefs coming up who could help him fulfil his dream of expanding overseas to take truly delicious tempura to Asia, Australia, and ultimately the U.S.
As Uchitsu talks about the tableware, it becomes clear that while he certainly has an eye for aesthetics and beauty, the more important part is the impression a piece leaves on his heart. 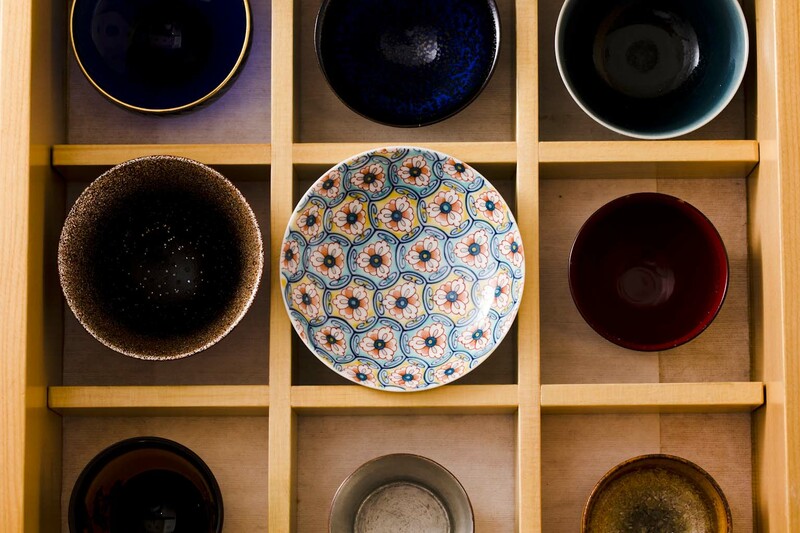 His beloved konabachi – the large red lacquerware bowl for mixing the tempura batter – was chosen to bring a focal point and color into the space. The collection of sake cups – lacquered copper, glass, tin and clay – is a visual journal of Uchitsu’s travels around Japan. 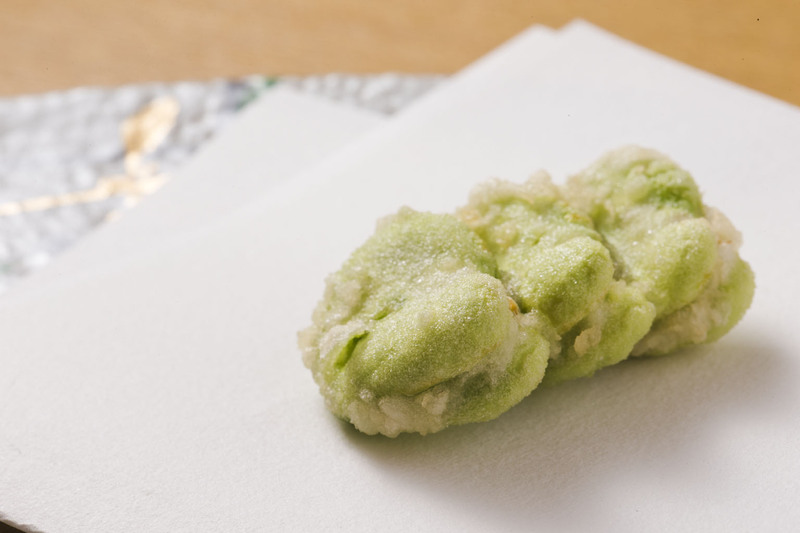 The solid rectangular plates, on which each piece of tempura is placed, exhibit both strength and beauty and were born from the chef’s vision and meetings with the potter at a local coffee house. The striking contrast of white and brown glazes, characteristic of Chosen Karatsu ware, and the pattern of blue and purple waves where the two tones intersect is almost mesmerizing. And the impressive piece on the window ledge? It was a gift from a regular customer – a local woman in her 80’s who is no professional but seems to have a golden touch when it comes to artistic endeavors. Uchitsu loves telling the story, and while perhaps he might not have had much choice as to its placement at first, these days he finds its presence to be a source of great comfort.